Perhaps the most important component of a successful IoT transformation is building it on a robust platform, because that alone can let your company go beyond random IoT experiments to achieve an integrated IoT strategy that can add new components systematically and create synergistic benefits by combining the various aspects of the program. “Connectivity & normalization: brings different protocols and different data formats into one ‘software’ interface ensuring accurate data streaming and interaction with all devices. Device management: ensures the connected ‘things’ are working properly, seamlessly running patches and updates for software and applications running on the device or edge gateways. Database: scalable storage of device data brings the requirements for hybrid cloud-based databases to a new level in terms of data volume, variety, velocity and veracity. Processing & action management: brings data to life with rule-based event-action-triggers enabling execution of ‘smart’ actions based on specific sensor data. Analytics: performs a range of complex analysis from basic data clustering and deep machine learning to predictive analytics extracting the most value out of the IoT data-stream. Visualization: enables humans to see patterns and observe trends from visualization dashboards where data is vividly portrayed through line-, stacked-, or pie charts, 2D- or even 3D-models. Additional tools: allow IoT developers prototype, test and market the IoT use case creating platform ecosystem apps for visualizing, managing and controlling connected devices. Despite (or because of, the complexity,) I think this is a decent description, because a robust IoT platf0rm really must encompass so many functions. The eight points give a basis for deciding whether what a company hawks as an IoT platform really deserves that title or really constitutes only part of the necessary whole (Aside: it’s also a great illustration of my Essential Truth that, instead of hoarding data as in the past, we must begin to ask “who else can use this data?” either inside the company or, potentially, outside, then use technology such as an IoT platform to integrate all those data uses productively.). Siemens’s IoT platform, MindSphere is a collaboration with SAP, using the latter’s vast HANA cloud. It ties together all components of Siemens’s IoT offerings, including data analytics, connectivity capabilities, developers’ tools, applications and services. MindSphere focuses on monitoring manufacturing assets’ real-time status, to evaluate and use customers’ data, producing insights that can cut production costs, improve performance, and even switch to predictive maintenance. Its Mind Connect Nano collects data from the assets and transferring it to MindSphere. The “digital twin” is integrated throughout the MindSphere platform. Kayser says that “there’s a digital twin of the entire process, from conception through the manufacturing and maintenance, and it feeds the data back into the model.” In fact, one dramatic example of the concept in action is the new Maserati Ghibli, created in 16 months instead of 30 — almost 50% less time than for prior models. Using the Teamcenter PLM software, the team was able to virtually develop and extensively test the car before anything was created physically. As with the company’s rail digitization services that I mentioned in my earlier post, there’s an in-house guinea pig for MindSphere as well: the company’s “Factory of the Future” in Amberg. The plant manufactures Simatic controllers, the key to the company’s automation products and services, to which digitalization is now being added as part of the company’s Industrie 4.0 IoT plan for manufacturing (paralleling GE’s “Industrial Internet.”). As you may be aware, Siemens’s efforts in this area are a subset of a formal German government/industry initiative — I doubt seriously we’ll see this in the U.S. under Trump. shorter delivery time: 24 hours from order. time to market reduced by up to 50%. Of course there are several other robust IoT platforms, including GE’s Predix and PTC’s Thingworx, but my analysis shows that Mindsphere meets IoT Analytics’ criteria, and, combined with the company’s long background in manufacturing and automation, should make it a real player in the industrial internet. Bravo! General Electric Keeps on Practicing What They Preach! I’m beginning to sound like a schill (no, not a typo, just a bad joke: short for [Curt] Schilling, the former Red Sox pitcher — sorry, I can’t get those guys out of my head today…) for GE, but it’s hard to argue with their impressive record of walking their talk about the “Industrial Internet,” their marketing term for the subset of the Internet of Things dealing with the industrial sector. Equally impressive, the Industrial Age behemoth turned nimble IoT leader said that by next year, almost all industrial products it makes will have built-in sensors and Big Data software to analyze the huge data streams those sensors will create. You in the corner office: got your attention? Equally important, given my insistence that the IoT is all about collaboration, GE simultaneously announced partnerships with Cisco, AT&T and Intel. It had already inked deals with Accenture and Amazon’s cloud subsidiary and has also invested in Pivotal, an Industrial Internet app creator. “… G.E. is adopting practices like releasing stripped-down products quickly, monitoring usage and rapidly changing designs depending on how things are used by customers. These approaches follow the ‘lean start-up’ style at many software-intensive Internet companies. That change is definitely going to make it into my e-book! 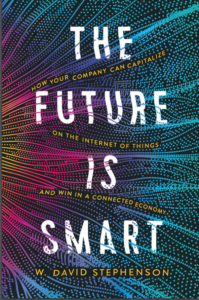 Brilliant example of how the IoT, by allowing companies to think in terms of systems dynamics, especially feedback loops, will have profound impacts on the design and manufacturing processes, integrating them as never before (oh, and don’t forget, the data from the built-in sensors will also allow companies to start marketing services — such as leasing jet turbines, with the lease cost based on the actual amount of thrust the engines create)! Combined, that’s definitely a paradigm shift! Given the diversity of industries the Predictivity products serve and GE’s global clout, I predict this level of commitment will radically accelerate the IoT’s adoption by big business, as well as accelerating the payback in terms of lower operating, energy and maintenance costs, and reduced environmental impacts. Will GE’s competitors in these sectors get on board, or will they be left in the dust?